Mercenaries. They will fight for any side... for the right price. 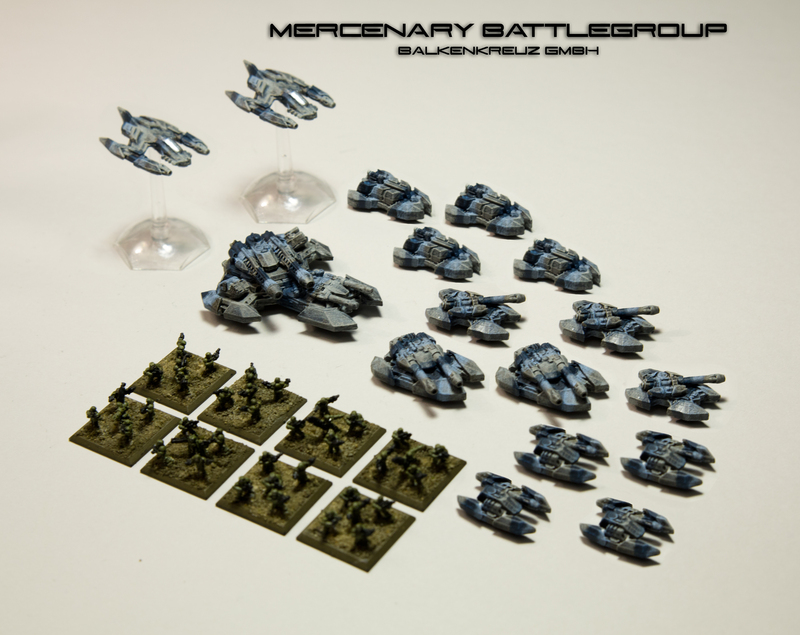 If you can afford their fee, consider supplementing your army with Mercenaries from "Balkenkreuz GmbH". Special Forces Infantry from Dark Realm Miniatures pair with Grav Vehicles from Plasmablast Games' Orbital Combine line. These mercs are well-equipped, well-trained, and ready for action. Our fifth Battlegroup option and third faction is now here and the project page has been updated. Ken worked hard to paint them in the scheme shown, even taking these miniatures with him on a work trip to West Virginia. We hope you like them. Select Mercs as one of your Battlegroups and you'll get a hard-hitting force that's sleek, swift, and ready for battle. As with all Battlegroups, each model includes an associated Combatant Tile. Let us know what you think! Comment on the project or this update. And, as always, please share. kibosh, Lee Sweeney, and 13 more people like this update. @Daynes, Thanks for posting that- I totally missed Reynolds' question. Great looking battlegroup! They would make a grand add-on for the Battlegroup Commander level. They do look great. How do you add onto a pledge? Quite true Lee. I could see a number of alien infantry being used here - perhaps Microworlds Kreen or Lizard Rider Infantry? Swap the INF and you have a great Alien look as well.